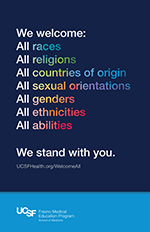 Resources that promote an equitable and inclusive environment for all members of our UCSF Fresno community are essential to a welcoming and supportive campus life and culture of diversity. UCSF Fresno was established in 1975 as a branch campus of the University of California, San Francisco to help address the severe shortage of physicians in California’s San Joaquin Valley. The San Joaquin Valley is one of the fastest growing and most diverse regions in the state. In Fresno County alone, there are over 70 distinct ethnic groups. 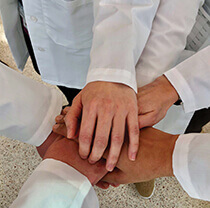 To help meet the distinct health care needs of the Valley, UCSF Fresno is committed to providing and fostering an academic and working environment that embraces and supports the diverse characteristics, beliefs and affiliations of its faculty, staff and trainees. Our commitment to inclusion and diversity is reflected in our Principles of Community. Resources that promote an equitable and inclusive environment for all members of our community are essential to a welcoming and supportive campus life and culture of diversity. As part of UCSF, UCSF Fresno enjoys support from main campus’ Office of Diversity and Outreach, which provides robust information regarding events, programs, services and online resources. At UCSF Fresno, the Diversity Committee meets monthly to discuss the status of diversity and inclusion at our campus and to continue developing resources that support, maintain and grow diversity within our UCSF Fresno community.